Shoes: Happy With Your Walk in Life? Not many of us are in a position to have someone design a pair of custom made shoes for us. But what if we could all wear a pair of shoes that best represents who – and what – we are? Shoes help define us and when we wear the right pair, our walk becomes our own. I’m not a big shoe person (though with my size 9 1/2 flippers, my husband would argue the fact), but I do know a few things about shoes. Shoes are symbolic of our walk in life. They are emblematic of our thoughts and the way we envision ourselves interacting with the world around us. We can all relate to how shoes can be too big, too tight, too small or too narrow. 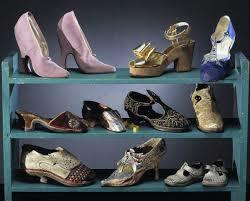 Shoes can also be too gaudy, too clunky, too outdated or too plain. Some of us have borrowed shoes or hand-me-downs and quickly realized that the fit was already contoured to someone else’s feet rather than our own. In all the above examples, the shoes and the person wearing them were not in unity. Or in agreement. All of us know what it’s like to work, play or socialize while wearing the wrong pair of shoes. Shoes ground us, carry us, and provide a relationship between ourselves and the earth beneath. They also help to define us — or not. Over the years, I’ve worn all kinds of shoes. Some were delicate and beautiful like the slip-on sequined slippers I received one Christmas. I adored those slippers and wore them till they fell apart. But other shoes I’ve worn have felt entirely too bulky and unattractive, like the black suede oxfords that accompanied my freshman year prep school uniform. Those oxfords might have been functional, but they made me look and feel like a troll. I was inspired to take up the subject of shoes as an indicator of the harmony – or lack of it – that we have in our life in today’s podcast. If you’ve ever felt “off” or out of sync with your own identity, then you need to tune in and listen to the following link by pressing here.